Serving the faith-based, environmental community. Calling All playwrights, actors and artists! What if the solution to the world's problems was right in front of us all along? 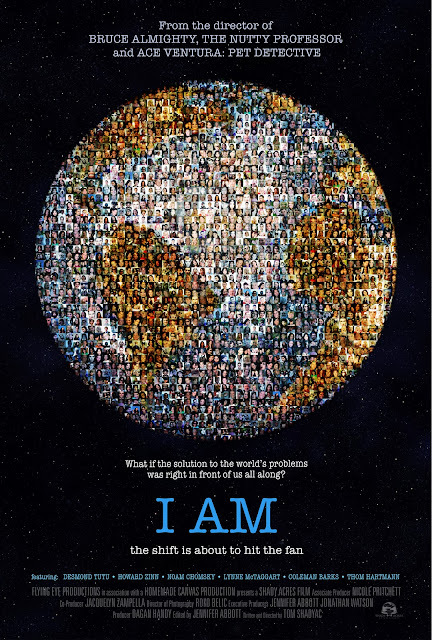 I AM (A life altering documentary). The shift is about to hit the fan. 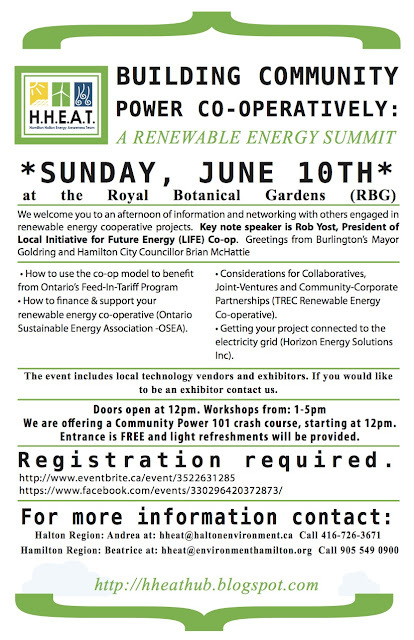 Sponsors: KAIROS, IDEA Burlington, Greening Sacred Spaces, Hamilton 350, Environment Hamilton, Halton Environmental Network. This month's Good Food Box order, at 424 boxes, was our biggest yet! Luckily the coordinators were very organized, and the volunteer team was motivated, energetic and hard working. The contents were described by some of the volunteers as some of the most delicious looking yet, including: local fingerling potatoes, beets, butternut squash, carrots, romaine lettuce, cucumber, mushrooms, tomatoes, oranges, bosc pears and bananas! 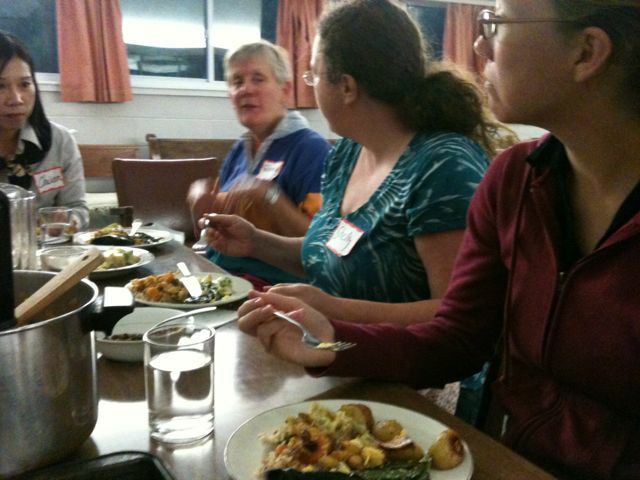 After a bit of rest I made my way to Friends Meeting House for Cooking from Scratch, a cooking class and communal meal presented by Greening Sacred Spaces, a joint program by Faith and the Common Good and Environment Hamilton. 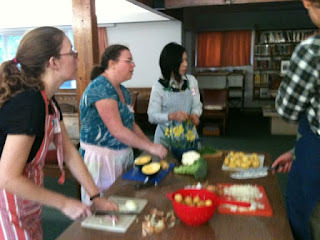 Darlene and Harriet led our group of twelve to cook up a gourmet meal using the contents of the Good Food Box. On the menu was: ginger and squash soup, warm beet and feta salad, roasted fingerling potatoes and a mixed salad with homemade croutons and roasted almond slivers. Getting a chance to get to know more about one another, we spent just over an hour preparing and compiling the ingredients and learning some new cooking techniques and recipes. Then we got to sit down, take pleasure in each other's company and enjoy the fresh, easy-to-prepare and delicious meal we had created! I had such a great time meeting new people; it's easy to forgot how something as simple as coming together to cook can produce such a wonderful socializing atmosphere. Incorporating a Cooking from Scratch program into your faith group or other community groups could be a great (and economic) way to get to know each other, learn some new cooking skills, and get a stronger bond to the food that you consume!" The Good Food Box is a non-profit fresh fruit and vegetable distribution program. It makes healthy fresh food affordable and accessible to everyone. The Good Food Box Network buys food at wholesale prices, with a preference for Ontario farmers. 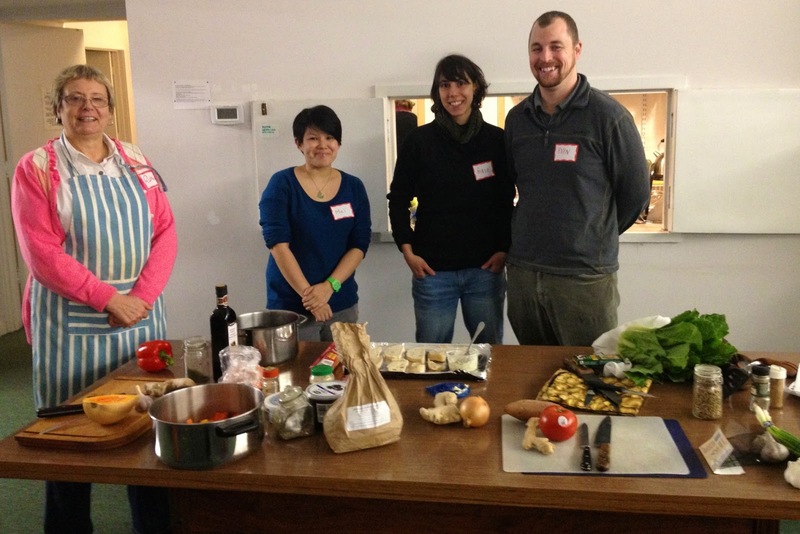 We'll gather at 5:30 pm and cook together until 6:30, ending with a delicious communal meal! Where: Friends Meeting House, 7 Butty Place, Hamilton. Although a hearty meal will be provided, a free GFB is NOT included, but you can obtain information about joining a Good Foob Box program in your community!! GSS End of Year Report. New Hope CRC. A jumble of bikes! Below are the winners of the competition.Congratulations and please be in touch to arrange pick up of your prizes! Their youth Emily Sinclair will receive a bike helmet for her efforts in organizing her faith group to do the challenge. Thanks to Zsuzsi Trim at Healthy Living Division, City of Hamilton for donating the helmet. Westdale United comes in a close second. 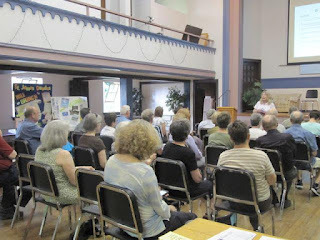 They will receive two certificates for the CarShare program courtesy of HamiltonCarShare, worth $50 each.http://communitycarshare.ca/hamilton/ They will receive a free meditation workshop valued at $150, cortesy of Kelly Hilton Meditation. Regina Mundi comes close with 103 people walking to worship that weekend. 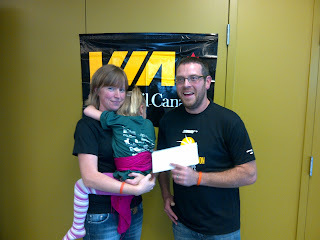 They will receive rainbarrel courtesy of RainBarrel.ca. They will also receive a GO Transit customer coupon valued at $50.00 and redeemable when used towards the purchase of GO Transit fare media- courtesy of GO Transit. My church is New Hope CRC. We are a small group of people who are focused on meeting the needs of our community in East Hamilton. For the most part the members of New Hope live in the same vicinity as our church. One of our ministries is a Bike Co-op, the purpose of which is to provide our community with affordable environmentally friendly transportation. I heard about the Greening Sacred Spaces contest through Jeff Neven, a member of New Hope, and we decided that our church was particularly well-suited to this competition. After several weeks of announcements and reminders the day of the contest arrived. I biked to church early in order to interview people about their mode of transportation as they arrived. Excitement grew as the jumble of bikes grew larger and the parking lot remained empty. There were several guests that Sunday and I was nervous because I knew they wouldn't know about the contest. But when I asked them about their mode of transportation, they carpooled! In the end, every single member, and guest, at our church that Sunday walked, biked, took the bus, or carpooled to church. Consistent to a church that is affiliated with a Bike Co-op, almost 50% of our turnout that Sunday biked to church. First session, Sept 19th. This could be you! Cooking from Scratch (with Good Food Box contents). h a preference for Ontario farmers. Start: 5:30 pm, cooking together until 6:30 and end with a communal meal. Bring your appetites and your willingness to learn. Bill Wilcox ( Hamilton Victory Garden) and Karen Burson (Eat Local at Environment Hamilton). Oct 17th, Wentworth Baptist Church. People around the globe need to be concerned about food security for a variety of reasons. Some of those reasons are place-specific (arid climates), some are political (conflict usually disrupts the food supply) and some are economic (not everyone can afford access to food). The issues are global in scale too: climate change, peak oil, and peak phosphorous are areas of concern. We cannot take the cheap food system that feeds so many of us for granted: not only does it leave us with a planet that is both "stuffed and starved", but the systems and conditions that we have assumed would always do the job is under threat, due to the depth and breadths of the challenges touched upon above. Speakers Bill Wilcox (Hamilton Victory Gardens) and Karen Burson (Eat local at Environment Hamilton) shared food security stories from the global south. Since 1993, the city of Belo Horizonte (Brazil) has received international prizes for its initiatives in reducing hunger and malnutrition, and has received the attention of academic studies and popular press throughout the world. Karen discussed some of Belo Horizonte's best known and most influential food programs, and will explore what the success of these programs might suggest about the future of food security right here in Hamilton. Bill Wilcox is a native Hamiltonian, who helped his Dad with market gardening at an early age. He enjoyed a long career in Purchasing Management, which included running his own Packaging Company for over 13 years. He is now semi-retired, and still has his passion for gardening—in fact, he has what his family lovingly refers to as a “Grow-Op” in his basement!! In 2007, Bill organized and implemented the first Victory Garden in Hamilton, which was located on 4 acres of property behind a church on the mountain. After 4 years of managing that garden, he decided to bring the Victory Garden concept below the mountain into the areas of highest need. This year, Hamilton Victory Gardens has SIX locations around the city, and has plans for expansion in 2013. Jamaican-born Karen Burson earned a B.A. in Political Science from Carleton University and has worked extensively in food service and policy for many years. After deciding she hated IT work and then discovering her desire to work as a personal chef (she dabbled in that work during a long stay in rural southern England) Karen started her Eklectic Kitchen which offered catering and personal chef servcie. 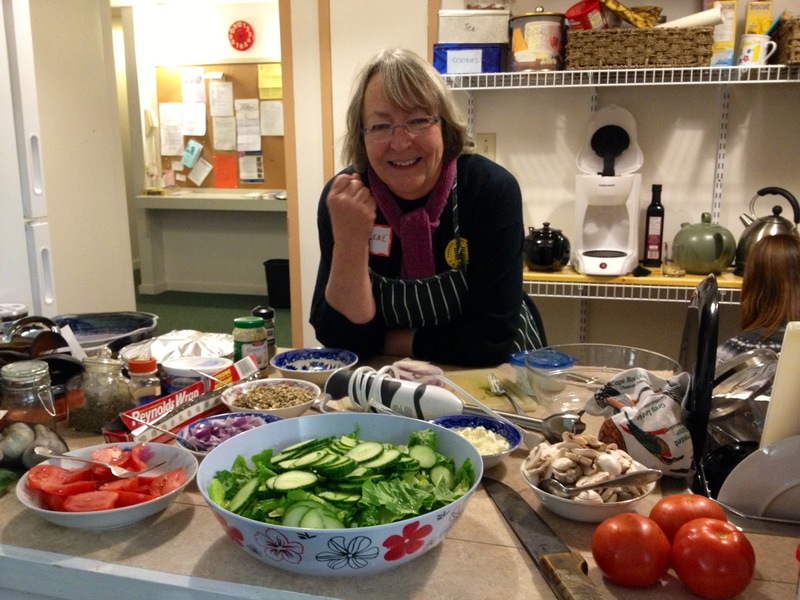 Her work at the Sky Dragon Community Development Cooperative earned an award from the Canada Organic Growers and she established a Slow Food Convivium in Hamilton in that same year. She now sits on the city’s Community Food Security Stakeholder Committee, works with Hamilton Partners in Nutrition and in February, and organized Hamilton’s first ever conference on food policy. 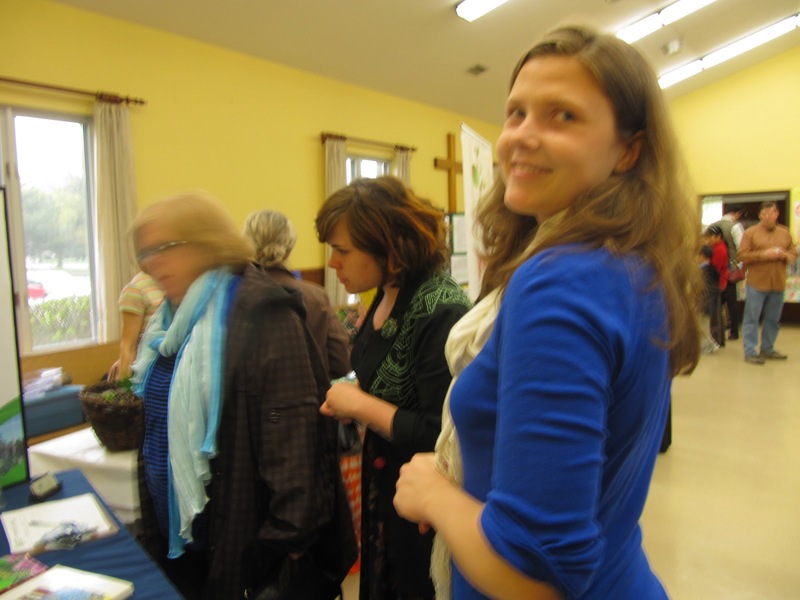 That successful venture landed her a stint with Sustain Ontario: the Alliance for Healthy Food and Farming, where she assumed the role of lead organizer for their Bring Food Home sustainable food conference held at Trent University in Peterborough. Currently, Karen is a project manager of “Hamilton Eat Local” for Environment Hamilton and has served in that role since 2008. More recently, she has become a popular presenter with her fun and frugal cooking demonstrations at the Hamilton Farmers’ Market Community Kitchen. Affordable food is very important to Karen. That’s why she co-founded the Hamilton Good Food Box Network which aims to make fruits and vegetables more accessible to people living on low incomes or living in “food deserts”, thereby making that food ever more widely available right across the city. Traveling green is an important way we can be stewards of our planet. Over the weekend of September 21st, 22nd and 23rd, Greening Sacred Spaces Hamilton invites people of all faiths to travel to worship that Friday, Saturday, and Sunday on foot, by bike, by public transit or carpool. Your faith group will be competing against other Hamilton faith groups for a chance to win a prize (TBA) for your place of worship. The groups with the highest percentage of participants gets the prizes. 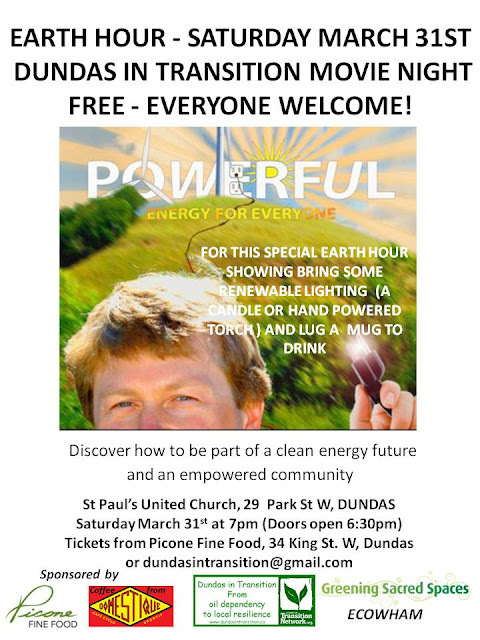 Prizes include a rainbarrel, two return tickets to Montreal, bike helmets, Go tickets, Mountain Equipment Co-op goodies, Meditation Workshop and more! ATTN: youth - you can win Jane Goodall tickets, if you pre-register. Are you a youth? Want to organize an event at your place of worship? Need volunteer hours? Want to win prizes? Then this is for you! The youth that pre-registers the most participants by September 14th will win tickets to see Jane Goodall on September 19th! 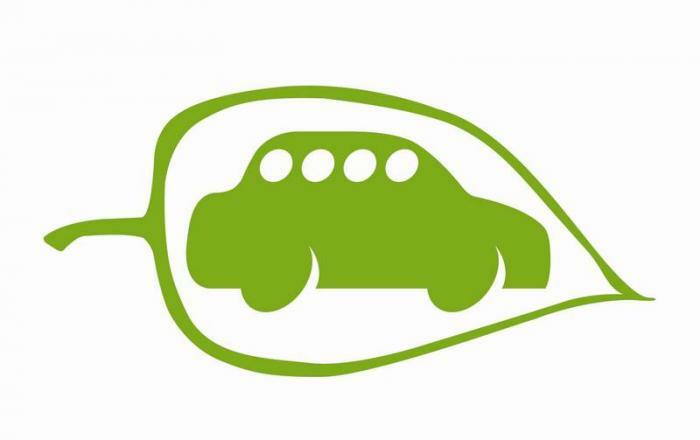 Over that weekend, the place of worship that tallies the highest percentage of people using green transportation will win the contest. You will receive volunteer hours for every hour that you advertise at your place of worship, (i.e. after services, giving announcements, taking registrations in foyers) and for the amount of time it takes you to tally on the weekend of the event. You will need your youth minister or a staff member from your place of worship that was present to sign your volunteer form. This is very flexible, and you can make it fit your schedule. Remember that the more you promote, the more successful your event will be. Talk to your leaders: can this day be turned into something more? A BBQ or social event afterwards? Be creative, take initiative! We want to hear all about how the event went, and will give you a volunteer hour for sending us a one page report or article and pictures of the event. The most creative and well written report will be featured in our newsletter. Be part of the fun while promoting active transportation. The first step is to register your faith group with Beatrice by email bekoko@faith-commongood.net or by calling (905) 549-0900. Then via email you will receive all the materials you need to get started. Once you register, participants from your group can join your team. Know some youth who might be interested? Make sure to let them know! Let’s celebrate 'a greener way to worship' together! Cook It From Scratch with Good Food Box contents! Cooking from Scratch (with Good Food Box contents): Local Chefs to lead the sessions. The Good Food Box is a non-profit fresh fruit and vegetable distribution program. It makes healthy fresh food affordable and accessible to everyone. For only $15 you receive a box of fresh quality produce worth $25 or more. GFB buys food at wholesale prices, with a preference for Ontario farmers. Read here for more about the Good Food Box. The sessions are led by a ‘chef’ (a different one for each session) who will plan a menu and she will have two assistants. Start: 5:00 pm, cooking together until 6:30 and end with a communal meal. Register for a session by September,12th to avoid disappointment. Mark your calenders! The much anticipated Focus on Youth Engagement Meeting will be held on Tuesday, September 11th. We are partnering with the First Unitarian Church to bring this event to you, many thanks to them! The question is, how do we get youth involved? In what? Our communities, our home faith communities, our close to home, sustainability issues. Why? The youth of today are tomorrows leaders, and can even be today's leaders when they set their hearts to something. Any age can make change. So, are you a youth leader, Pastor, Priest, Minster, worker, committee member, or volunteer? Are you from a place of worship with a lot of youth, and want new ideas? Are you from a place of worship with few youth, and want to brainstorm? Are you a youth who has ideas, or wants to see what we're about? Everyone is welcome! Bring each other, team up, (carpool), and lets start to Focus on Youth! National Student Summer Food Summit! Don't Miss the Deadline! - Provide delegates with a greater understanding of food issues on a national scale and begin narrowing their focus to the local level. - Strengthen the student voice by profiling students as leaders within the food movement and providing delegates with a stronger vision for the future of food on campus. - Increase delegates’ understanding of food security: thoughtful action is only possible when people are fully informed. - Provide delegates with a greater understanding of the 6 principles of the National Student Food Charter and their relation to food on campus. It is half way through the summer and it has flown by, or should I say sailed? So far the campers from Fifty United, Emmanuel United, Pioneer United, and Carlisle United have all taken the Pirates Oath to help protect and conserve water in their daily lives! These kids have been armed, and now they can fire cannons of knowledge back to their home churches and parents about saving water and not plundering from nature. 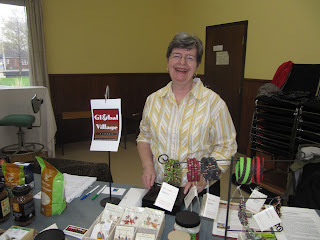 Next week we will be heading to Westdale United Church, followed by Olivet United, and then St. Mark's United Church. The camp counsellors have been amazing every week and I always look forward to seeing them in action with the kids. I have learned new games and pirate related songs from them every time. Talk to your kids about saving water, dress up as pirates at home, and say the Oath often to remind you of your duty! To not let my car be washed in the street. And to wait until nightfall to water my flowers. As a good pirate, we do good water deeds. Cleaner water is their greatest wish. We arrr the pirates who don’t plunder! Your faith group will be competing against other Hamilton faith groups for a chance to win a prize (TBA) for your place of worship. The group with the highest percentage of participants gets the prize. Be part of the fun while promoting active transportation. The first step is to register your faith group with Beatrice by email bekoko@faith-commongood.net or by calling (905) 549-0900. Then via email you will receive all the materials you need to get started. Once you register, participants from your group can join your team. We all know how important water conservation is. 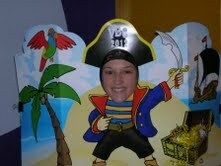 For the next few weeks at GSS we will be running the Pirates Who Don`t Plunder activity at children`s summer bible camps. Here is the video we use: an oldie but a goodie from Sesame St. This week, sit down with your own kids and talk about water conservation, or look at how you can conserve water better at home. We can all be better pirates. Your youth group contains highly valued young minds, and the hot question of the day is: How do we get them involved? We are hosting a brainstorming session focused on engaging youth in activities, groups, and have them become more sustainably conscious. 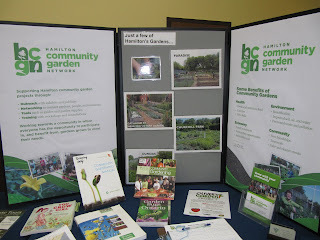 These activities include community gardens, eco-justice teams, and in sustainable minded youth groups within faith communities. How can we bring these concerns to our youth in an appealing way, and help our youth become leaders so our community initiatives can grow and flourish under their own hands. Please join us as we discuss these questions and brainstorm ideas to improve our youth resources and initiatives within our city and programs. 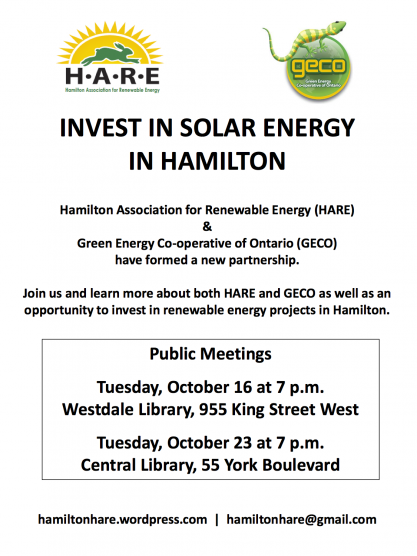 155 Gage Ave North in Hamilton. 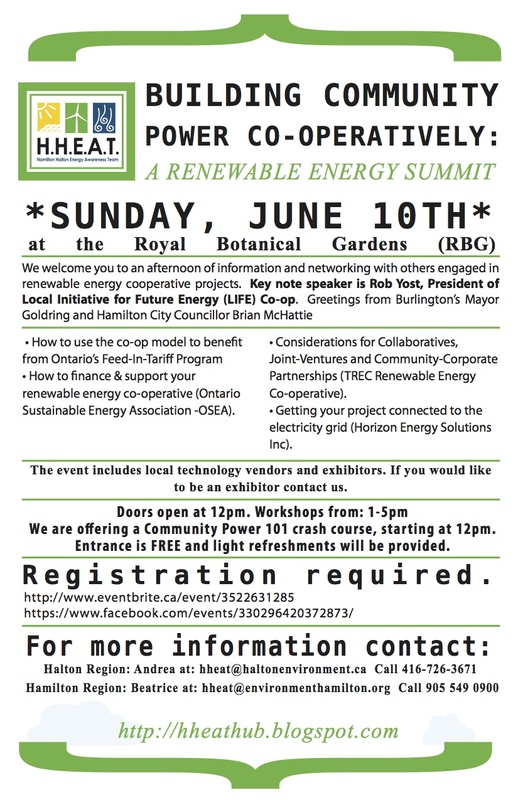 GSS was very excited to see the great turnout at the Renewable Energy Summit this past Sunday at the RBG. 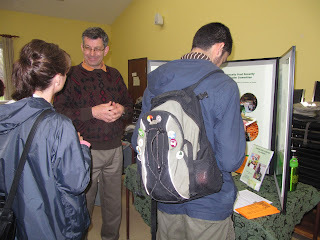 Its wonderful to see how interested people are about Community Energy Co-operatives. Here are some pictures from the event. 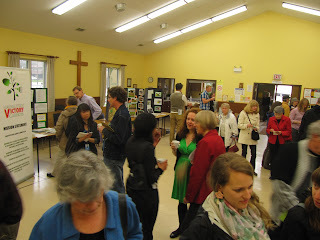 May 28th, 2012 Melrose United Church, Hamilton. 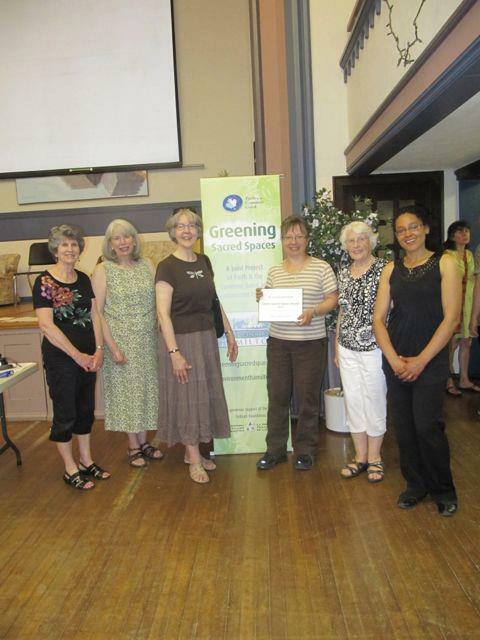 Melrose United Church earned a Green Sacred Spaces Award of Excellence for their work in conducting an energy audit, retrofitting with energy efficient compact fluorescent lighting, upgrading weatherstripping, and initiating a rooftop solar panel project. Congregants are encouraged to take environmental messages home through weekly e-bulletins and e-newsletters. 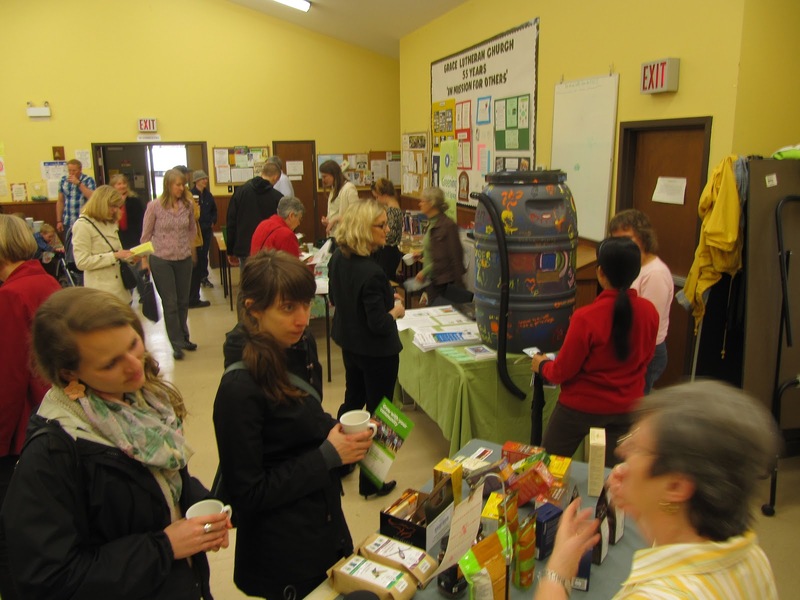 Melrose United Church partners with various environmental organizations. Grace Lutheran was honoured with a Green Sacred Spaces Award of Excellence for their work hosting the Good Food Box program, growing a community garden, planting fruit trees, naturalization of the property and hosting a wonderful food fair featuring over 10 local food initiatives. Grace Lutheran has completed an energy audit, basic retrofitting and upgrading of boiler and is exploring the possibility of going solar. Congregants are encouraged to take environmental messages home through weekly e-bulletins and e-newsletters. Grace Lutheran Church partners with various environmental organizations and the Victory Gardens Hamilton group. Melrose United Church and Grace Lutheran recognized for their efforts to reduce energy consumption, improve the environment and build community resiliency. 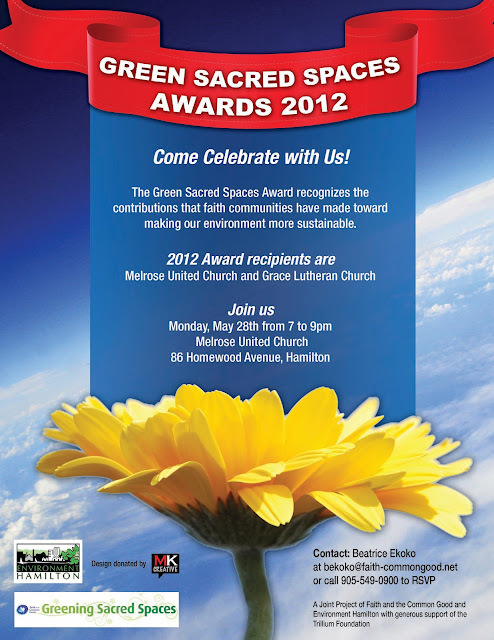 The Green Sacred Spaces Awards of Excellence are coordinated and judged by Greening Sacred Spaces Hamilton, a collaboration between Faith and the Common Good and Environment Hamilton. Locally, Greening Sacred Spaces comprises more than 140 faith communities. 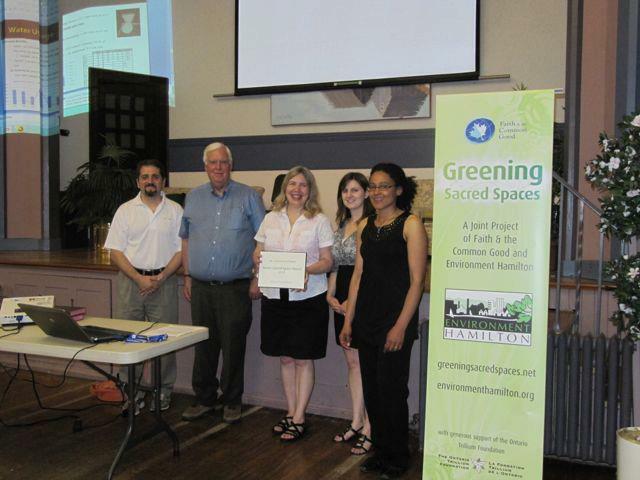 Melrose United Church earns a Green Sacred Spaces Award of Excellence for their work in conducting an energy audit, retrofitting with energy efficient compact fluorescent lighting, upgrading weatherstripping, and initiating a rooftop solar panel project. 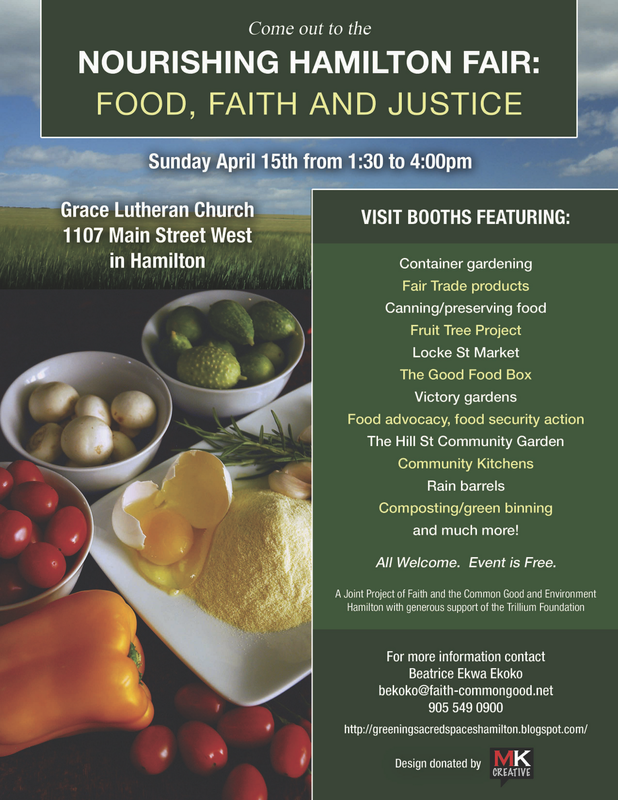 Grace Lutheran will be honoured with a Green Sacred Spaces Award of Excellence for their work hosting the Good Food Box program, growing a community garden, planting fruit trees, naturalization of the property and hosting a wonderful food fair featuring over 10 local food initiatives. Greening Sacred Spaces assists more than 500 faith communities in Canada take action to create a more sustainable and energy-efficient place of worship. as renewable energy and energy conservation . The Green Sacred Spaces Awards of Excellence recognize the contributions that faith communities have made toward making the environment more sustainable. 3. Involvement in outreach programs in the community at large and with other faith communities to encourage energy conservation. Green Sacred Spaces Awards 2012. The Green Sacred Spaces Award recognizes the contributions that faith communities have made toward making our environment more sustainable. 2012 Award recipients are Melrose United Church and Grace Lutheran Church. Melrose United Church. 86 Homewood Avenue, Hamilton. East Plains United Church, Burlington. Alanna Mitchell, author of Sea Sick: the hidden crisis of global ocean change is an environmental journalist who has travelled the world talking to scientists about the oceans. — Oxygen. Most of Earth’s oxygen is produced by phytoplankton in the sea. These humble, one-celled organisms, rather than the spectacular rain forests, are the true lungs of the planet. — Climate control. Our climate is regulated by the ocean’s currents, winds, and water-cycle activity. Alanna Mitchell shared about how she joined the crews of leading scientists in nine of the global ocean’s hotspots to see firsthand what is really happening around the world. She talked about the impact of coral reef bleaching, the puzzle of the oxygen-less dead zones such as the one in the Gulf of Mexico, and the devastating implications of the changing Ph balance of the sea. Alanna delved into the traumatic experience of coming to terms with how sick our oceans are. Encased in a minuscule vessel with one other passenger (lying head to toe side by side), at the bottom of the Ocean, having an 'accident' where she ended up wetting the vessel and then having to clean it up, she had an epiphany. If you foul your nest, you have to clean it up. And so it goes with the Earth, our home. Hope, that mysterious force that keeps us going when all the odds are against us, preparing ourselves for the unexpected, flooded down on her and she says, 'the transformation to hope happened because I wanted to hope." 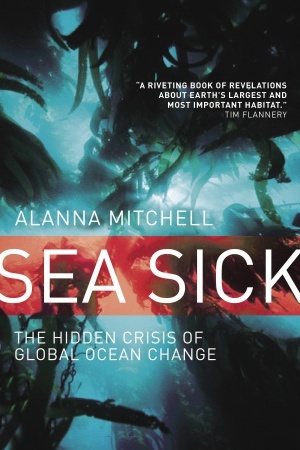 Sea Sick is the first book to examine the current state of the world’s oceans —the great unexamined ecological crisis of the planet—and the fact that we are altering everything about them; temperature, salinity, acidity, ice cover, volume, circulation, and, of course, the life within them. We had an audience of 100 people. Even More Fun at the Nourishing Hamilton Fair! Fun at the Fair! April 15th Grace Lutheran Church. 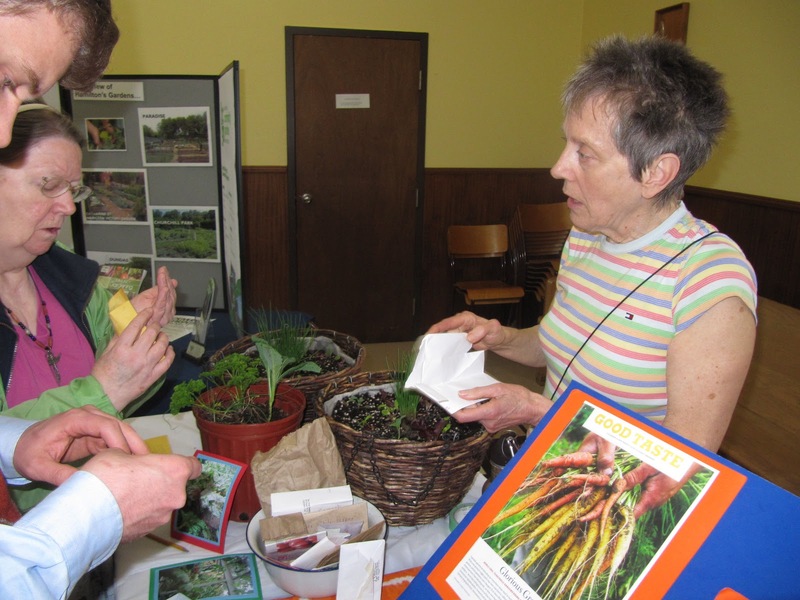 Garden lovers traced the origins of local food Sunday — down to the roots. Intercultural organization Faith and the Common Good paired with Environment Hamilton to host the Nourishing Hamilton Fair: Food, Faith and Justice at Grace Lutheran Church. The afternoon event featured 10 booths with information about local green groups such as Earth Day Hamilton-Burlington, Hamilton Victory Gardens and Hamilton Community Garden Network. There were many issues associated with food they hoped to raise awareness around, Greening Sacred Spaces project animator Beatrice Ekwa Ekoko said. “It’s an aspect of justice, really. If you don’t have space or money, how are you going to get food?” she said. Faith and the Common Good’s Greening Sacred Spaces program provides faith groups with practical ways of being more sustainable places of worship. Sean Hurley, 51, moved to Hamilton two months ago and came to the fair because his wife has a garden and was interested in learning more about food issues. 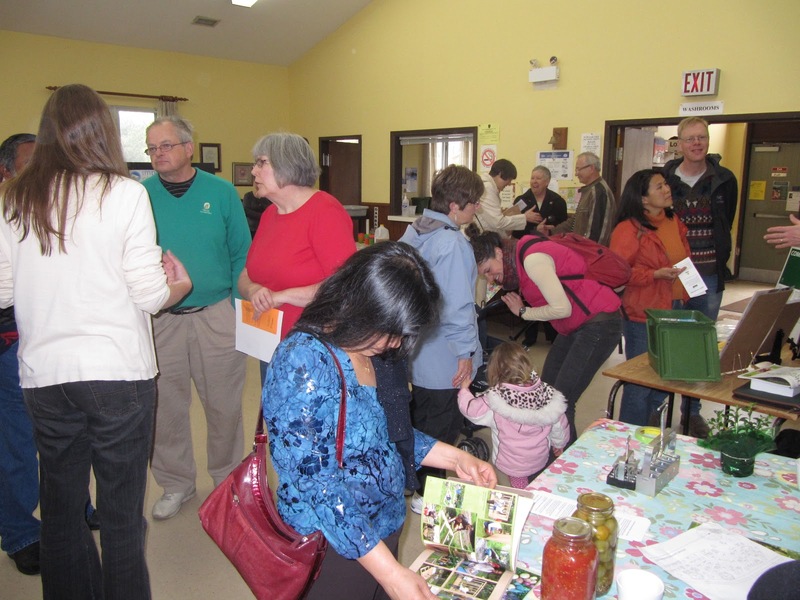 Sara Collyer, operations manager of the Neighbour 2 Neighbour Centre, spoke to participants about the organization’s community gardens at places of worship, a school and at a residence on the Mountain used to supply their food bank or neighbours in need. “Traditionally, emergency food (wasn’t) the healthiest food so we feel by doing this we are able to provide healthy food to people who come to use our services,” Collyer said, adding they had 30,000 pounds of fresh vegetables last year. Jim Sweetman, vice-chair of the Waste Reduction Task Force, was also present, distributing information on the city’s green bin program and material on recycling. The Dundas resident has been composting in his own back yard for the past two years and encouraged others to try it in addition to using the green bin. “This city is definitely progressive and ahead of most communities in Ontario, but there’s still more we can be doing and keep pushing,” Sweetman said. Great turnout for this event. A good 100 plus individuals showed up to hear and view this film about how to be part of a clean energy future and learn from the European examples. The Good Food Box is a non-profit fresh fruit and vegetable distribution program. It makes healthy fresh food affordable and accessible to everyone. The Hamilton Good Food Box Network delivers directly to various locations all over Hamilton. For only $15you receive a box of fresh quality produce worth $25 or more. We buy food at wholesale prices, often from local farmers.We understand that with busy schedules convenience is key so we’ve set up hubs across the city. Pick ups take place the third Wednesday of every month. We're looking for new pick up hubs. If your faith group is interested, please contact Beatrice and she will put you in touch with the coordinators. Hamilton Eat Local's February is Farm Month had a great kick off with Greening Sacred Spaces, 'Nourishing Hamilton: Food Faith and Our City' event at the Freeway Coffee House. We screened 'Nourish Peterborough,' a documentary film that follows ten unique community groups from Peterborough who are advocating for food security and sovereignty. These are programs that have a substantial influence on many people's lives, though many of them go overlooked and/or underfunded. 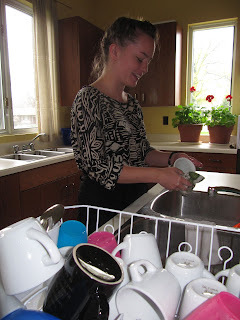 Nourish Peterborough provides a platform for these organizations, giving members, participants, volunteers and staff, a louder voice in the community. The screening was followed by a panel discussion on nurturing the growing organic food movement in Hamilton. Crystle Numan, from Environment Hamilton's Good Food Box Network and Neighbour to Neighbour's Building Better Futures talked about how advertisement and the media have us thinking that 'healthy' means blemish free, symmetrical, polished etc when in reality this means unhealthy pesticide use, or transportation over great distances. Crystle has been involved with community gardening since starting Hill Street Community Garden (5 churches initiated this) in 2010. Loretta Jaunzarins, pastor at Grace Lutheran church talked about how her church got involved with food security issues by starting a good food box program ( veggies and fruits at a very low cost, once a month and available to everyone who wants one). She's experimenting with straw bale gardening on church grounds and so far, good things are happening. She is also looking into growing fruit trees at the church. Bill Wilcox, with Hamilton Victory Gardens ( a faith based initiative) spoke about the work he and his organization are doing to fight poverty in Hamilton. They have already secured sites to raise more garden beds across the city. 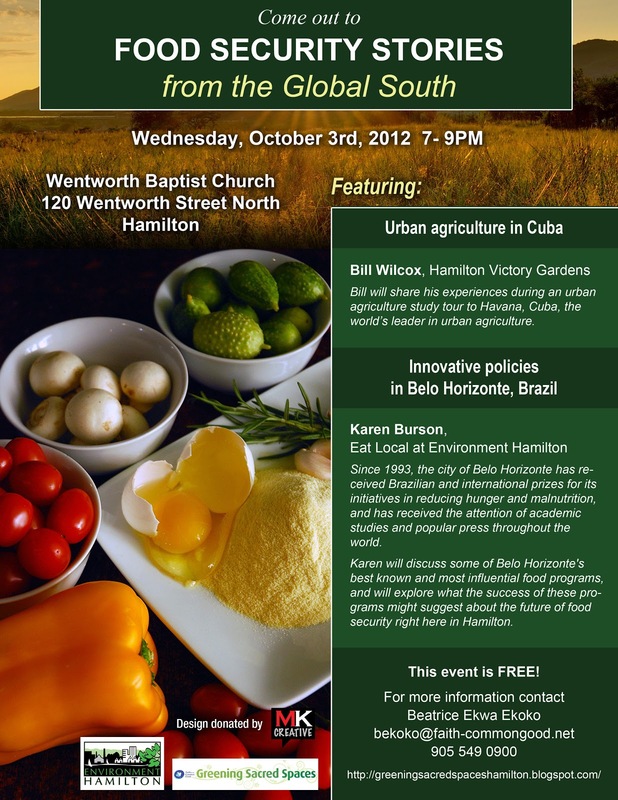 Bill talked about the Cuban example of urban agriculture and how much we can learn from these masters of simplicity. Clare Wagner, Community Garden Program Coordinator at Green Venture showed us a map of community gardens in Hamilton. She talked about the need to collaborate with one another as community groups in order to get the best results. we also heard from pig farmers Tanya and Mark Veenstra who shared with us photos of their ethically run farm (Boar and Chick farm). We enjoyed organic chili at $2 a bowl and a very kind person from the audience brought a large bag of delicious apples that he shared with the crowd! 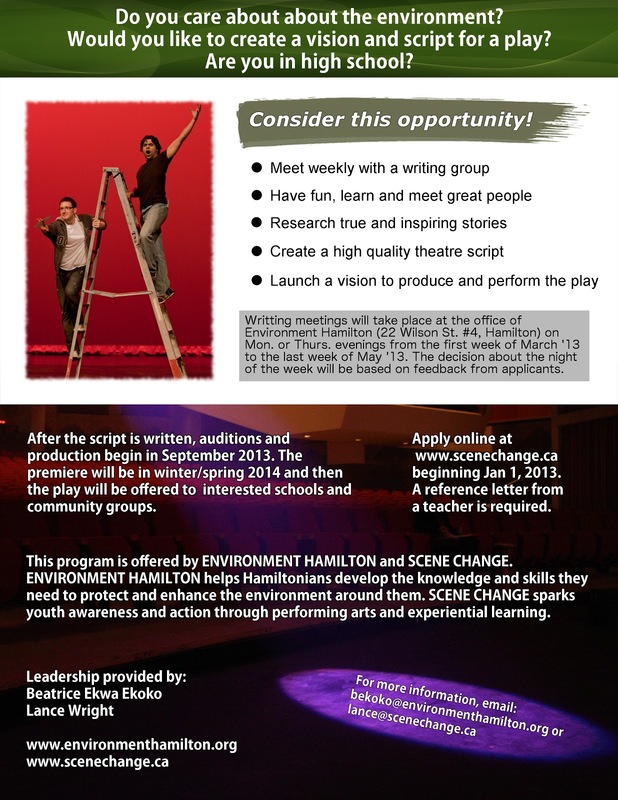 Environment Hamilton Youth Group is organizing a play. It's the OTESHA play: Morning Choices. clothes to wear, leisure time entertainment, buying coffee etc. Each set of choices have significant, tangible impacts on the Earth and its inhabitants. Carless' choices have negative impacts. Hopeful's choices are a number of small, thoughtful efforts to consciously make choices that have positive impacts. Mother Earth enters after each time Carless and Hopeful make a set of choices. She clarifies the situation and dispels myths with additional facts regarding each issue. I have included the poster with the audition information and hope that you can encourage your youth to try out for some of these fun parts. 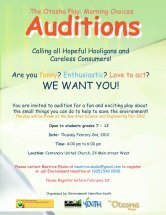 Auditions are February 2nd at Centenary United Church, 24 Main St W.
Please let others know about this opportunity as well! The play will be shown at that Bay Area science and engineering fair at the end of March. There will be a good 1,500 students who will see it! Maybe after this we can find other venues in which to perform it. 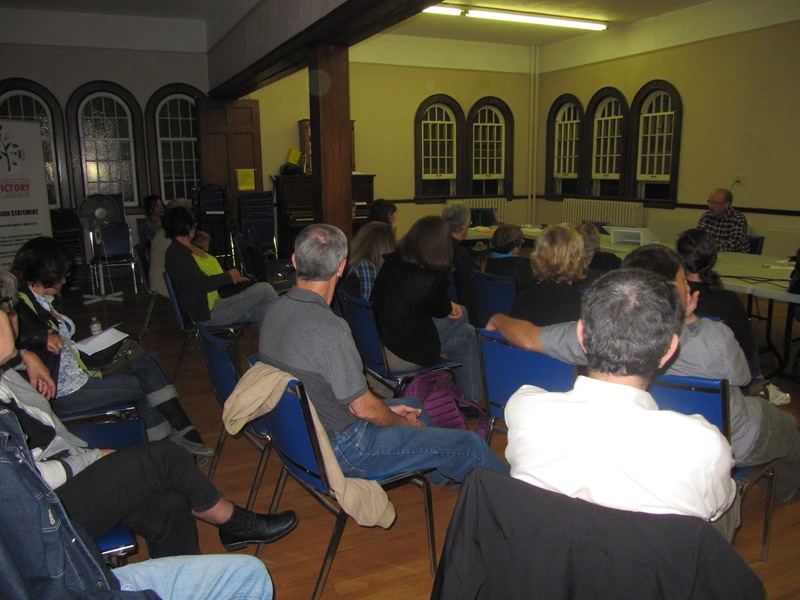 Divestment From Fossil Fuels: Have questions? Welcome to Greening Sacred Spaces (GSS) Hamilton at Environment Hamilton. 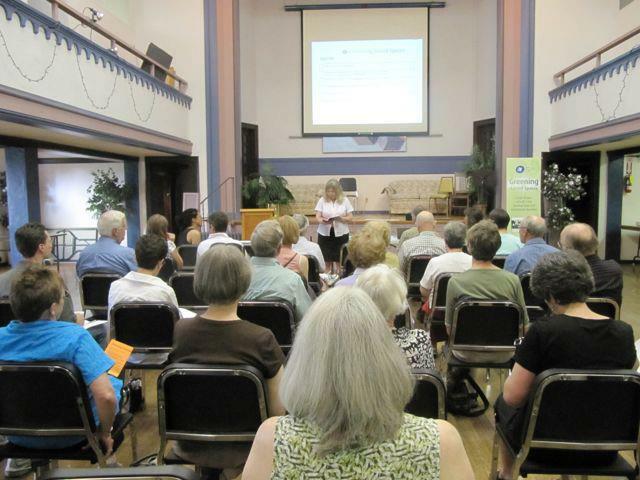 GSS is a joint program of 'Faith and the Common Good' and 'Environment Hamilton' to assist faith communities in taking practical actions towards a more sustainable and energy efficient place of worship and to educate members of the community about ecological issues. Greening Sacred Spaces will help people of faith live out the call to protect our planet home within their own context. It also provides an opportunity to engage in meaningful conversations about the spirituality of eco-sustainability. Victory Gardens Seeking Your Help! What is required for a church to get involved with Victory Gardens? 1. An expression of interest. 2. Space on which to build the beds, whether at the church site or elsewhere. 3. A few folks who are committed to make the project go (ideally at least one of which will act as the Site Coordinator. 4. Some financial commitment (we will try to allocate the balance necessary to build the beds). 5. Contributions of tools, seeds, etc. provide fresh local organic produce for local food banks and soup kitchens. McMaster Centre for Climate Change: Get your project on the map! Library at Environment Hamilton-Donations accepted! !